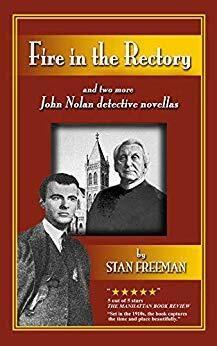 This collection of three short detective stories offers a chronological continuation of John Nolan’s career as a private investigator in New York City from 1915–1918. A recent immigrant from Ireland, he finds himself struggling to make a name for himself amidst prejudice, professional competition, and changing times. The first story centers on a fire in a rectory. John finds himself drawn into the case purely because he lives nearby and can thus assess the scene quickly. As he conducts his investigation, he begins to worry that the fire wasn’t an accident, yet the insurance agency doesn’t seem nearly as concerned about the truth as they are about looking out for their own interests. The second story concerns a leading pacifist who is running for Congress, following his father’s footsteps while hoping to keep the United States out of World War I. He and his family start to receive death threats of what will happen if he doesn’t pull out of the race, and he hires John to ensure his safety even as he continues his candidacy. The third story follows John’s attempts to find a missing Amati violin for a client. The hunt is considerably complicated after the client is arrested on suspicion for murder, having supposedly used a recently-purchased gun to kill a rival violinist. He claims his gun was stored in his violin case, though—the same case which is still missing. The stories can be read out of order, as each is complete by itself, but they nicely show the progression of John’s career and the growth of his family along the way. The stories themselves can feel a bit uneven, as the first two seem to have enjoyed more polish and thought than the last one, but all three offer a vibrant sample of what life in New York City, just after the turn of the century, could offer. Most of the characters, especially in the first two stories, seem well-developed, with motives and specific characteristics and mannerisms. There are red herrings, yet enough information is smuggled in to where readers will likely be able to guess who the culprits are and what truly transpired before the solutions are revealed. There are times when John and his contemporaries feel a little modern, though. It’s not something that comes out in specific anachronisms—it’s more the result of how they respond to relatively modern concepts like divorce, abortion, kidnapping, and ballistic forensics (even when the latter doesn’t appear to have been in mainstream use for a few more years). John’s bringing his wife with him to prison to talk to a client at one point reinforces this feeling. Though her presence assisted the plot, it seemed like the last place he would’ve wanted to bring his wife. Well-balanced and intriguing, those who like an old-fashioned mystery with a dose of historical realism will enjoy these stories. The plotting is realistic with a gentle pace, reminiscent of a cozy mystery, yet there are plenty of scenes rich in action and danger for readers who like excitement.